All were welcome at Fink's Hotel in Hallettsville, Texas. It has been said that Mr. and Mrs. A. Finkelstein always had a room in their hotel and a home-cooked meal for any who appeared at the door. From the richest dignitary to poorest hobo, the Finkelsteins made room for all – even those with no money to pay. According to a story in the Lavaca County Tribune on August 4, 1959, the old building that was once known as Fink’s Hotel, was soon to be razed. The article was contributed to the paper and the writer wasn’t identified. The Finkelsteins, along with their four children, started the business, around 1904, in a three-story brick building that had once been owned by the Masonic Lodge. According to the paper, it was located on land where the Texaco station stood (in 1959). In 1909, the Finkelsteins built the structure that would become Fink’s Hotel and go down in history as one of the most admired establishments in the city. No doubt this was due to the kindness of its owners. It was said that the Finkelstein family had a deep faith in God and believed in sharing all they had with others, rich and poor alike. The tastes of the hotel’s customers ranged from beans and biscuits to caviar and champagne. And evidently the menu was such that guests, no matter what their status in life, could come away satisfied with the cuisine. Fink’s Hotel was known far and wide as a place where people were never turned away, regardless of their ability to pay. In the early days, persons on horseback or traveling in carts and covered wagons would seek lodging at the hotel. The newspaper reported that many came via the Old Spanish Trail seeking fortune in the deep Southwest. 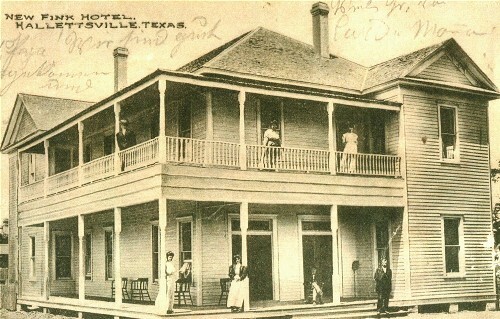 Immigrants arriving at the port in Galveston were told about Fink’s Hotel and encouraged to seek it out if they were traveling through the area. Old timers said that gypsies visited Hallettsville annually in those days. They camped on the outskirts of town. Often times they remained an entire season and would do their peddling and begging from the back door of Fink’s Hotel. The establishment was a favorite of tramps and they would leave messages on gate posts for other hobos – informing them that “Dad and Mother Fink” would always give them food and shelter on those cold, dreary nights. During the depression in 1933, Fink’s Hotel struggled like all the rest but they survived. While many small businesses went under, the Finkelsteins continued on while feeding more unfortunates, free of charge, at the backdoor. According to the paper, both Mr. and Mrs. Finkelstein passed away in 1938, leaving the hotel to their four children – three of them stayed on and managed the business. In 1940, a dreadful flood hit the town and while many establishments were submerged in six feet of water, Fink’s Hotel personnel gave free coffee to anyone who cared to be served. The hotel became headquarters for the American Red Cross during that terrible time.